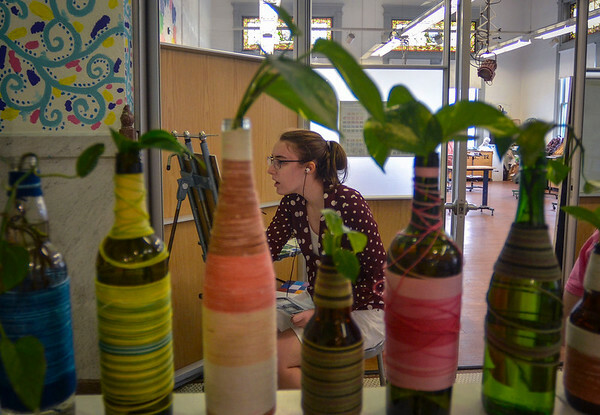 Out of the classroom: Alexis Fortman works on her painting of the bottles that line this counter in the Fairbanks Hall lobby on Monday afternoon. Nancy Nichols-Pethick's introduction to painting class was tasked with venturing out of the painting studio in Indiana State's historic art building and finding a section of the lobby to record it with oil paint. Students looked through famous paintings, both classic and contemporary to find a color palette they liked and they took those colors and would capture their scene with that palette. Some students focused on a very small section of the lobby while others tried to encompass huge portions of the building.